We argue that the confined and deconfined phases in gauge theories are connected by a partially deconfined phase (i.e. SU(M) in SU(N), where M < N, is deconfined), which can be stable or unstable depending on the details of the theory. When this phase is unstable, it is the gauge theory counterpart of the small black hole phase in the dual string theory. Partial deconfinement is closely related to the Gross-Witten-Wadia transition, and is likely to be relevant to the QCD phase transition. The mechanism of partial deconfinement is related to a generic property of a class of systems. As an instructive example, we demonstrate the similarity between the Yang-Mills theory/string theory and a mathematical model of the collective behavior of ants [Beekman et al., Proceedings of the National Academy of Sciences, 2001]. By identifying the D-brane, open string and black hole with the ant, pheromone and ant trail, the dynamics of two systems closely resemble with each other, and qualitatively the same phase structures are obtained. G. ’t Hooft, Dimensional reduction in quantum gravity, Conf. Proc. C 930308 (1993) 284 [gr-qc/9310026] [INSPIRE]. J. Liddle and M. Teper, The deconfining phase transition in D = 2+1 SU(N) gauge theories, arXiv:0803.2128 [INSPIRE]. 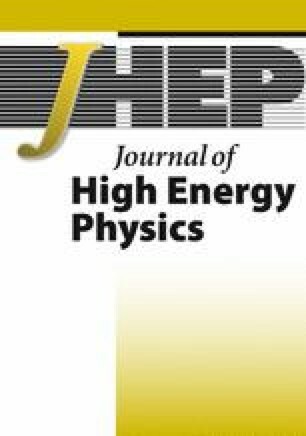 B. Lucini, M. Teper and U. Wenger, The high temperature phase transition in SU(N) gauge theories, JHEP 01 (2004) 061 [hep-lat/0307017] [INSPIRE]. S.R. Wadia, A Study of U(N) Lattice Gauge Theory in 2-dimensions, arXiv:1212.2906 [INSPIRE]. B. Sundborg, Strings hot fast and heavy, Institute of Theoretical Physics, (1988), https://gupea.ub.gu.se/handle/2077/14375. A. Dumitru, J. Lenaghan and R.D. Pisarski, Deconfinement in matrix models about the Gross-Witten point, Phys. Rev. D 71 (2005) 074004 [hep-ph/0410294] [INSPIRE]. Y. Aoki, G. Endrodi, Z. Fodor, S.D. Katz and K.K. Szabo, The order of the quantum chromodynamics transition predicted by the standard model of particle physics, Nature 443 (2006) 675 [hep-lat/0611014] [INSPIRE]. S. Muroya, A. Nakamura, C. Nonaka and T. Takaishi, Lattice QCD at finite density: An introductory review, Prog. Theor. Phys. 110 (2003) 615 [hep-lat/0306031] [INSPIRE]. D. Schaich, Progress and prospects of lattice supersymmetry, in 36th International Symposium on Lattice Field Theory (Lattice 2018) East Lansing, MI, United States, July 22–28, 2018, 2018, arXiv:1810.09282 [INSPIRE]. D. Berenstein, Negative specific heat from non-planar interactions and small black holes in AdS/CFT, arXiv:1810.07267 [INSPIRE]. 1.School of Physics and Astronomy, and STAG Research CentreUniversity of SouthamptonSouthamptonU.K.